Once again, a few hours this weekend at the Metropolitan Wargamers brought me an introduction to yet another fantastically-addictive board game: Clash of Cultures. 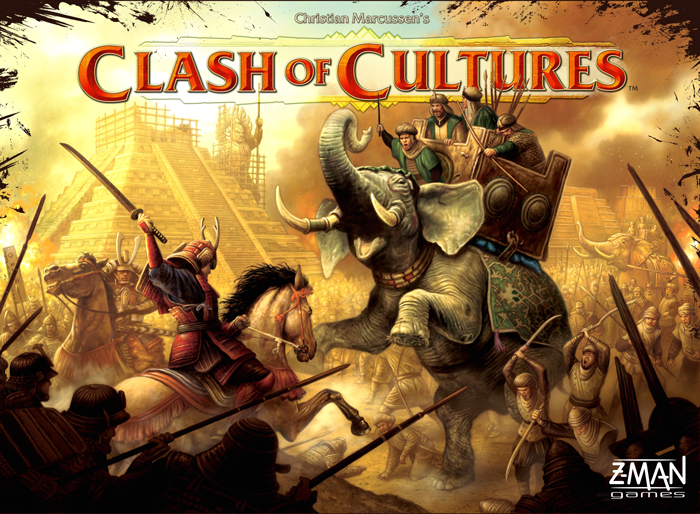 Released just last year by Z-Man Games, Clash of Cultures (aka COC) is a civilization-building endevour where each player seeks to exert their expanding cultural influence and ultimately vies for control of the imagined world of the game. If you melded Risk, Settlers of Catan and Sid Meir’s Civilization into one game and then multiplied that times ten, you’d have something like COC. Play begins on hexagon terrain board with much of the territory hidden and open to exploration and expansion. Each player chooses three “actions” within their turn such as exploring, developing cities, reaping resources from the land, building armies or navies and expanding their culture. You can choose to increase the happiness of your cities or exploit the citizens, with each decision bringing plusses and minuses to the results. Cultural advances in areas such as Agriculture, Warfare, Spirituality, Economics and Science provide limitless variation in how each player chooses to develop their civilization. Different Government focus – Democracy, Autocracy or Theocracy – limits and expands your ability to develop the game world in different ways. “Event” cards insert random famines, bounties, natural disasters and other far-reaching events into the game, while “Wonder” cards provide players the opportunity to focus their resources on building architectural masterpieces while scoring big points. In the end, it is points earned through expansion, building and completing “Objective” cards that wins the game. This isn’t a casual game, and a significant commitment to a play time of a minimum of an hour per player is required. My three-player game this weekend stretched to 4+ hours, and a week ago I sat in on the end of a four-player game that had run to 5-6 hours. With hundreds of plastic miniatures, cards, resource chips and cultural advances combined with quick shifts in dominance, the game moves remarkably fast but is at the same time administratively challenging. In the game this weekend, I chose to focus on a massive defensive military build-up (those are my red soldiers filling the center of the board in the photo above). Another player sank all his resources into building monumental wonders like the Great Pyramids and Great Gardens. 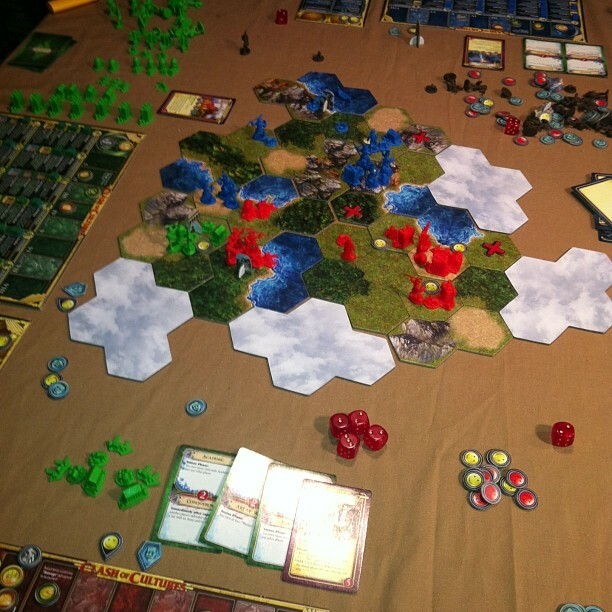 The third player held half the territory while likewise building his armies and exploring coastal areas at the edge of the board. In the end, I acted too late with my superior military might and watched as several cities fell into the control of the third player who snuck through the middle in the final turns for a win. At its heart, it’s the variety that’s making COC so wildly popular at the club in Brooklyn right now. Each game provides an opportunity to try out a different strategy and to see how each new culture clash plays out anew.